Professional wedding coordinators can make all the difference in the success of a wedding day, and Nutan Shah of Elegant Events has consistently displayed skills that make her one of the top wedding planners in Los Angeles and Orange County. For this wedding, the coordination team ensured that despite the early morning start at the Ritz-Carlton Laguna Niguel, guests never had to wait and the luncheon reception took place on schedule and without any delays. Her thoughtful planning helped ensure that we had ample time to get to the ocean for sunset portraits. I loved this stage setup with hanging roses designed by Nisie's Enchanted Florist. 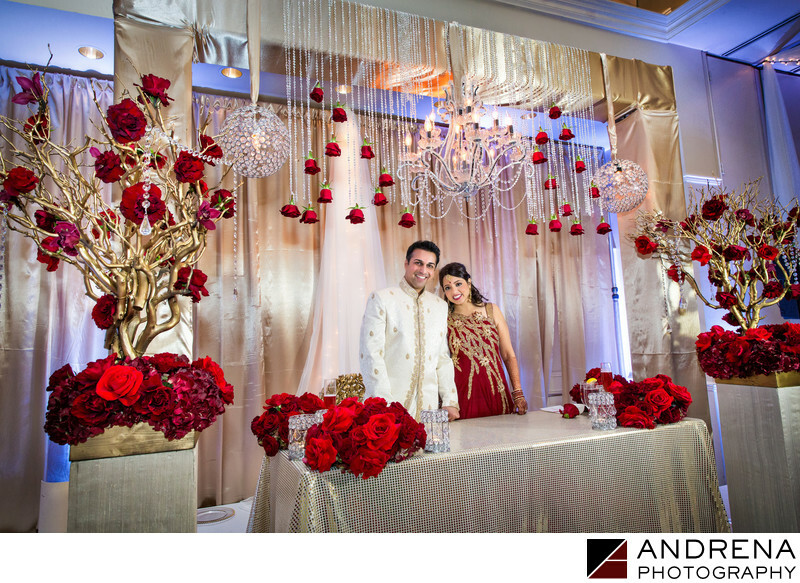 The chandeliers mixed with the beautiful dangling roses created a lovely frame for the couple's sweetheart table.